Are you still wrestling with giving a surprising gift to your honey,lover,kids or someone special to you? It is more than a speaker,meantime it is a fashionable toy. Soft and fluffy adorable toy is made fo Super Soft Plush Fabric,most definitely more cozy & cuddly. Unique design on feet are speakers,control buttons are hided under waistcoat on back, prevents kids pressing them by accident. Enjoy better sound on the way, everywhere you go,It delivers full, natural sound from the unique speaker. Stuffed with lots of love and materials that are NEVER recycled,it would be perfect gift for any occasion. Bluetooth: Bluetooth 3.0 international standard, automatic pairing, you can adjust the volume directly through the stereo, 10m lossless high-fidelity transmission, enjoy the wonderful music. Size & Style : 9"x9"x12" in / 21x21x30 cm . Soft and fluffy adorable toy is made for Super Soft Plush Fabric,most definitely more cozy & cuddly. 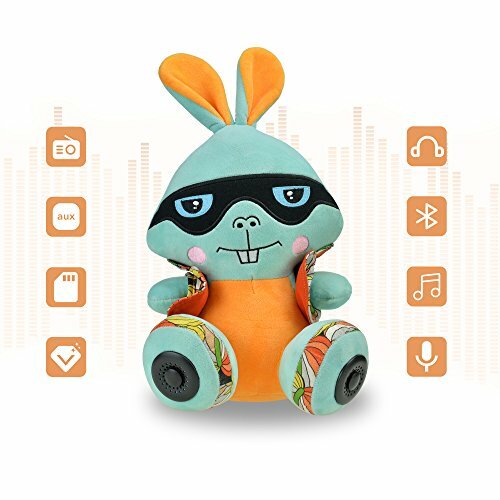 Unique design: It is more than a speaker,meantime it is a fashionable toy.Speakers are on bear's feet ,and control buttons are hided under waistcoat on back, prevents kids pressing them by accident. If you have any questions about this product by CALEEO, contact us by completing and submitting the form below. If you are looking for a specif part number, please include it with your message. Wireless Bluetooth Speaker，BOOMER VIVI Plug-In Card Outdoor Portable Low-Tone Gun USB Charging, Suitable for iPhone 6/6S/7,Mobile Phone, Android, IOS, Microsoft System.